My daughter has 2 closets in her bedroom. 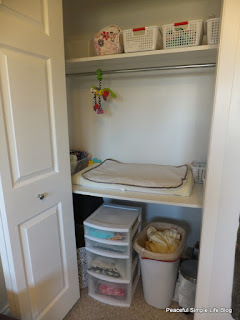 One of the closets has a built in desk/change table in it. The previous owners used it as a desk and then as a change table for their baby. 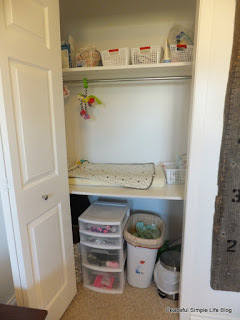 We liked the idea and left the closet to be our change area. I went through the closet this weekend and organized it a bit. I should have taken more pictures, but I wasn't thinking. The before and after look similar but I did make a lot of progress. 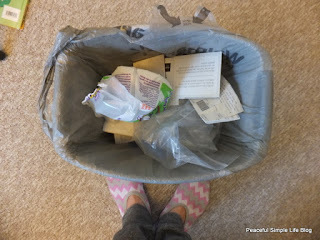 I threw away a small garbage can of baby lotions. Miss. E had terrible eczema in her first year of life. It has since cleared. It was caused by her allergies and once we removed those foods from her diet, her skin cleared up. I got rid of any products that we don't use or that didn't work. We tried a lot of products so there was a lot to sort through! The visual difference is not noticeable, but I am happy that I sorted through everything. We now only have the products that we use. I also moved a few books that I had set aside in this closet to the bookstand in the other closet. It looks much better. Yay! Miss. E's room is neat and tidy again! My son also had eczema and he has food allergies. I wonder if there was any sort of connection for him too? We had to switch to all Aveeno products, so I have a ton of scented lotions and body washes that never got used. It always feels great to get a space organized! 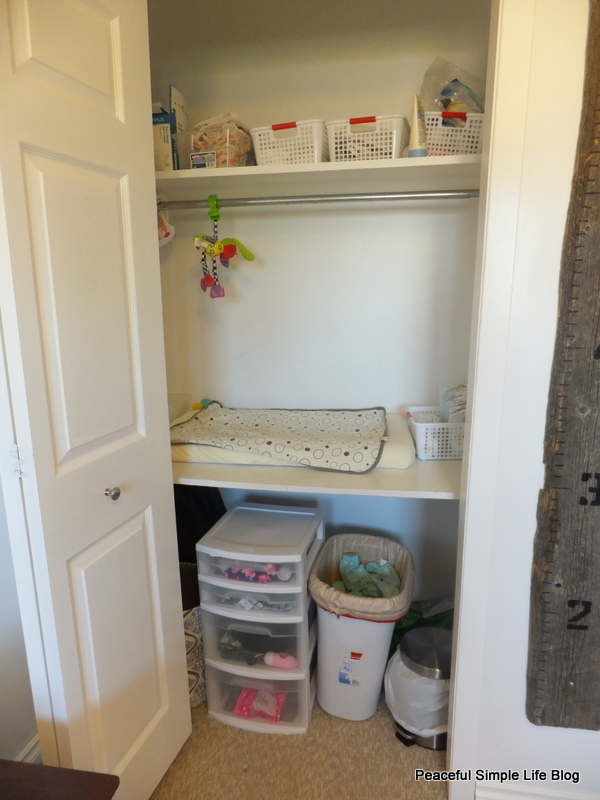 Great use of space with the changing table/desk in the closet! I love a good clear out. It's so satisfying when it's all done. Especially a load of trash to be hauled out. It truly is satisfying. You feel so light and free when it is done!